Don’t leave them in the fridge to get all moldy like I did. Make a lemon cream tart or a cake; then everyone will be happy. Yesterday I finished my final Wilton Cake Decorating Class, Fondant and Gum Paste. Our instructor gave us a choice on which final cake that we wanted to do that was in the book. At first I was going to do a square cake and make the colors black and white, but then I accidentally made an 8-inch round cake so I ended up picking another cake and decided not to change the colors. The cake I made was a Red Velvet box cake mix. I made a cream cheese icing filling and iced the cake in Vanilla Italian Buttercream and covered it with Fondant. When we started off class, we all rolled out our fondant to cover our cakes. This weeks I decided that I wasn’t going to make any of my fondant because I didn’t have time so I just used the Wilton pre-made stuff, even though it tastes like crap. I rolled it out pretty thin because I was starting to see through it and I knew that it shouldn’t get any thinner. I placed the fondant on my cake and started to work it around the cake and it started to tear. I didn’t even pull on it or anything. My instructor came up and told me it was rolled a little too thick. I keep working with the fondant and it is going pretty well and then another side tears, and the fondant is starting to get hard. Meanwhile, all the ladies at my table are having tear problems with their fondant, but the other 10 people in the class are doing just fine. I think our table is cursed because alot of us didn’t have this much trouble covering our wedding cakes. My instructor comes up in the middle of my disaster and feels the fondant (it started to get hard) and asks what I was using (Wilton). I also tell her that it is a brand new package and I just opened it at the beginning of class. She leaves and comes back with a free box of fondant for me because apparently I had a bad batch….grrr. I finished covering my cake, tears and all. I wasn’t too worried about all the imperfections because I knew that the handkerchiefs and the band around the bottom would cover most of the crappiness. Our instructor went over how to make a favor box, inlays, and different borders. Then we were to finish our cakes. I actually finished my cake before class was over, but I had one more problem. The instructions for my cake said that I needed to cut out 8 handkerchiefs . When I was about to cut them out I realized I forgot my pastry wheel at home so I had to borrow someone elses. For my entire table, one of us forgot something so we were actually sharing everything 🙂 I cut out the 8 and then start to place them on the cake…..
Well I actually needed 8.75 handkerchiefs. I told my instructor and she asked if I cut out the right one (yes) and if my cake was the right size (yes). So I added another one to the back of the cake so you can’t see the crappiness of it 🙂 From then on it was easy sailing. I put the favor box on top with the daisy and then I finished off the cake with the bottom border. While taking pictures of my cake Theoden decided to watch and hope for a piece. There is a rumor going around that later this year there is going to be 3 more classes added to the Wilton Cake Decorating lineup, but no one knows what they are or when it is going to happen. When the classes finally get announced, I will take a look at them to see if it is anything worth persuing. In class we started to learn how to make fondant roses, but we ran out of time and only learned up to the rose bud. It is actually pretty easy and very pretty. I can’t wait to learn how to actually finish it. The actually cake is the Berry Surprise Cake for Tuesdays with Dorie next week. I am not going to write anything about the taste of the cake, but just remember this I took the fondant off the cake and redecorated it to make it look pretty. It will look different when I post on Tuesday, but it is the same cake 🙂 The fondant came off perfectly it was awesome. I started the Wilton Cake Decorating Course 2 last week. I am so thankful that we don’t have to make a cake every week like in Course 1. That was CRAZY. Just having a cake in my apartment every week is dangerous. For Course 2 there is only the final cake that you have to make. 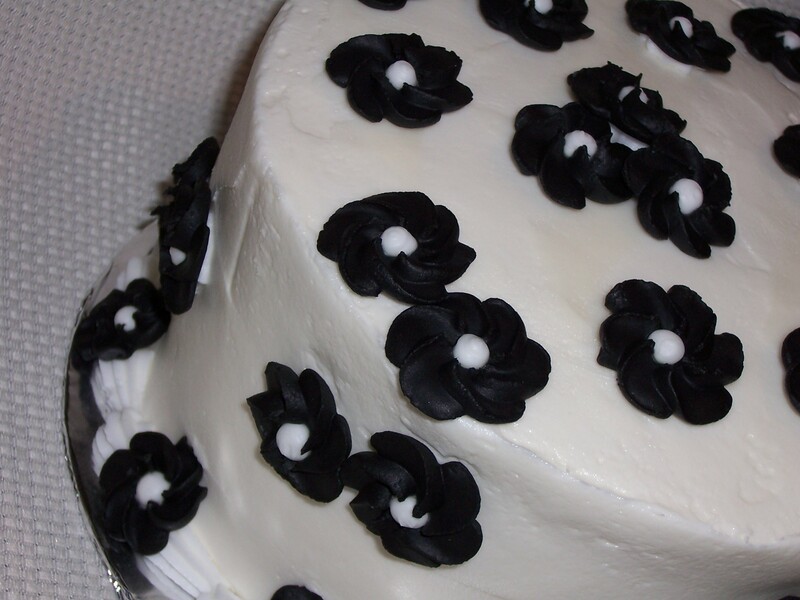 All of the classes concentrate on all of the flowers that you need to make to put on your cake. For the second class, we had to learn to make two new icings: royal icing and color flow. Both of these I have actually worked with before while decorating cookies, and when I made the swirl flowers for one of my cakes in Course 1. I found it interesting that when making the royal icing the wilton method essentially tells you to put everything in a bowl and mix it together for 7-10 minutes. Any time that I have learned how to make royal icing, first you whip up the meringue powered with the water until stiff peaks form, then you add the sugar and whip it up until everything is combined. I asked my instructor why Wilton did it this way and she didn’t have any idea. Oh well. For all the things that seemed to go wrong on Monday and Tuesday, I actually finished my cake. Not in class though. I was having some issues and I mean ISSUES. First, the District Manager at Michaels decided to order the store a CRAP ton of Christmas Trees. With nowhere to put them, they got dumped in the teaching classroom. So we ended up having class in their break room.